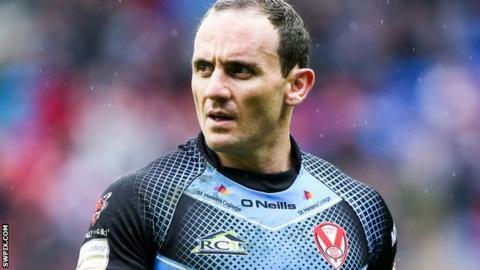 St Helens half-back and 2008 World Cup winner Lance Hohaia has retired from rugby league with immediate effect. Hohaia, 32, helped Saints to the 2014 Super League title but lasted just two minutes of the Grand Final after being punched twice by Wigan's Ben Flower. The Kiwi joined from New Zealand Warriors ahead of the 2012 season on a four-year contract. Earlier this month, Hohaia suggested to BBC Radio Merseyside he was considering a return to the National Rugby League. "Lance Hohaia has informed us of his retirement from rugby league and will therefore not play for the club again," said a Saints statement. "Lance has been a valued and integral member of the squad for the last three and a half years and we thank him for his service. "We wish him and his family well in their life after rugby league with St Helens." St Helens won last season's Grand Final at Old Trafford, although Hohaia was unable to continue in the match after the incident involving Flower, which resulted in the Wales prop being handed a six-month suspension. The former New Zealand international accepted a one-game ban for striking Flower with his forearm, which led to the Wigan prop's retaliation. After missing the first game of the season because of his ban, Hohaia featured eight times for Keiron Cunningham's side this term, scoring two tries. At the 2008 World Cup, Hohaia started at full-back and scored a try in the final as New Zealand upset Australia to win the competition for the first time.